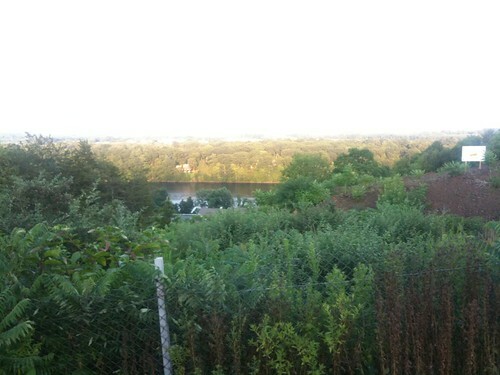 Scenic overlooks help me a lot, because they tell me "this is where you should stop and take a picture of the goodness you've been seeing." This is from western Massachusetts, near Hadley. We'd picked a hotel in Hadley to position us in striking distance of the knitter's mecca Lori wanted to visit the next day. A miniature golf course nearby tempted me. 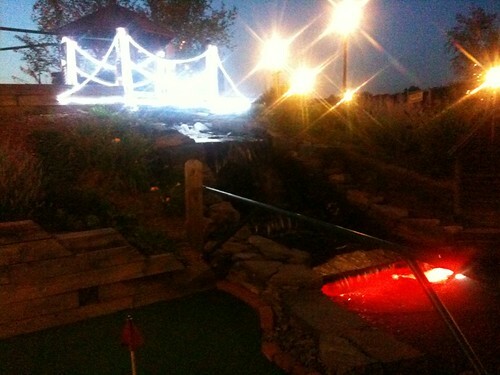 I'm fond of miniature golf, since it evokes childhood memories of playing with my grandparents. We decided that we were still full enough that we could play a round before dinner. I've mislaid the scorecard, but I believe that Lori won the first nine, but I won on the back nine. For dinner, we drove into Amherst in hopes of finding an Italian restaurant recommended by the hotel clerk. Unfortunately, it was closed - and it seemed that most of Amherst's restaurants were closed on Sunday evening. 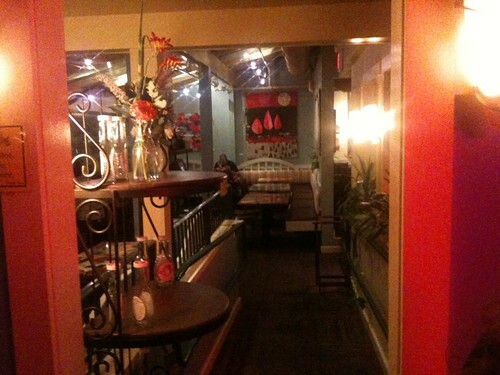 By Hobson's Choice, we settled on Judie's Restaurant. On entering, we quickly decided that this was a restaurant where the faculty ate, instead of students; it was nicely appointed, with handpainted tables and classical music playing. "Classical music playing" may not give exactly the right impression, though - this is the first time I remember hearing Mussorgsky's "Night on Bald Mountain" playing over a restaurant sound system. It definitely added a certain something to the soup course. Judie's specialty is massive popovers with the volume of a loaf of bread and the mass of a muffin. 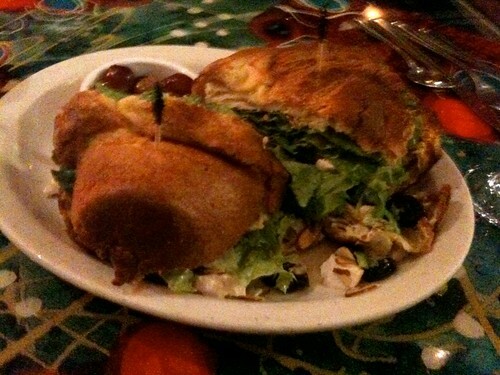 Lori ordered a cold sundried cherry chicken salad sandwich on a popover. This was pretty good; the dried cherries and toasted almonds made it taste very summery. 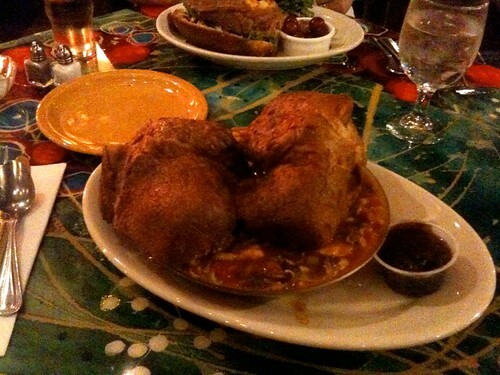 I ordered the gumbo popover. I might have enjoyed this more if it had a slightly different name. The gumbo was reasonably good; I believe the mushrooms are nontraditional for gumbo, but the nature of gumbo makes it hard to declare that any ingredient is utterly inauthentic. 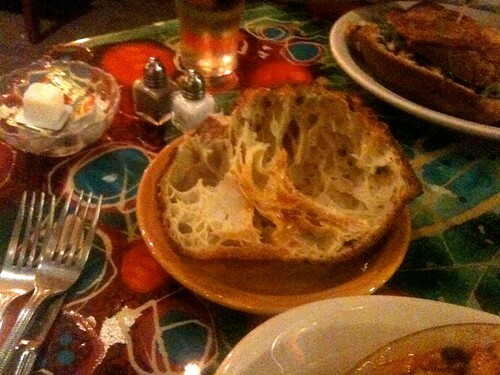 But because it was called a "gumbo popover" (instead of a name like "gumbo with popover", which was how it was served) I kept trying to put the gumbo in the popover and eat the combination. And this didn't work very well; the popover was tough enough that it needed special attention to cut or bite, and doing that special attention made any gumbo in the popover spill out. I would have been happier leaving them separate. 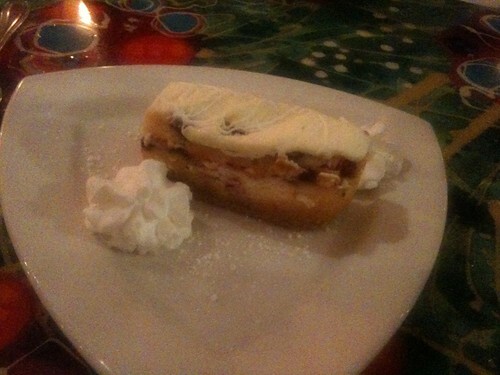 For dessert, we shared a "Summerberry Stack", made with layers of cake, berries, and cream. I wasn't wild about it, but Lori was delighted.